Happy Father’s Day – Send For A Superhero | What is ML Reading? Recently, ML forbade me to read the new picture books before bringing them home. Last night, we plowed through a pile of them Until we read Send For A Superhero! by Michael Rosen and illustrated by Katharine McEwan, I didn’t plan to post on Father’s Day. The book is about a Dad reading a comic book to his children. There is text with illustrations showing the family’s interactions during the story. Other pages are filled with the actual pages of the book the children are being read. I loved the various superhero names… Steel Man, Super-Flying-Through-The-Air-Very-Fast Man and Incredibly-Big-Strong-Green Man. None of these conquer The All-Around-Bad Guys… Filth and Vacuum. An expected superhero saves the day. You’ll have to read the book to find out who. 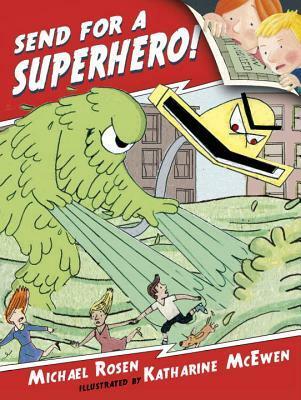 For me the real superhero of this book is the Dad. Dad’s who read to their children are the biggest superheros around in my book. Which means my dad is a superhero. I have fond memories of him reading to me. The author and illustrator live in the United Kingdom. Do they have a specific day to celebrate fathers there? Just researched it. They do and it’s today. This entry was posted in Picture Book and tagged Katherine McEwen, Michael Rosen, Send For A Superhero by mlreads. Bookmark the permalink.